Although polling data is important to show public opinion, public policy should not be based on polls or public opinion. Matters of morality and ethics are always constant despite changing opinions. While policy positions are not determined by opinion polls or election results, both are useful information to have. Polls reveal national trends and predictors, and the trends on the abortion issue are positive. While the nation remains starkly divided on the issue, more people identify as pro-life every year. Polls also show strong support for laws and regulations that protect the health and safety of women seeking abortion and give them more opportunities to choose life. At the time of the Roe v. Wade decision in 1973, a majority of Americans were sympathetic to a pro-choice view. When the Gallup Poll surveyed Americans in 1995, 56 percent considered themselves pro-choice, while only 33 percent called themselves pro-life. In the last 18 years, a positive trend has emerged with a growing number of pro-lifers and decreasing number of those who hold pro-choice views. While the nation is still split, for the last few years pro-life has become the majority view in the United States. The most recent 2013 poll shows the overall position on abortion stands at 48 percent in favor of pro-life and 45 percent in favor of pro-choice. The gap has slowly closed over the past two decades. America is becoming increasingly pro-life. As the graph indicates, the percentage of Americans that are pro-life has risen 15 percent and those that are pro-choice have decreased 11 percent. The life movement has clearly made up significant ground and is trending towards becoming a dominant majority in the United States. 49 percent find abortion morally wrong. 42 percent believe that abortion is morally acceptable. 33 percent of Americans believe abortion should be legal under any circumstances. 13 percent believe abortion should be legal under most circumstances. 38 percent believe abortion should be legal in only few circumstances. 13 percent believe abortion should be illegal in all circumstances. 24 percent of Americans believe abortion should be legal under any circumstances. 42 percent believe abortion should be legal in only a few circumstances. 19 percent believe abortion should be illegal in all circumstances. 26 percent of Americans believe abortion should be legal under any circumstances. 38 percent believe abortion should be legal in only a few circumstances. 20 percent believe abortion should be illegal in all circumstances. The pro-life movement in America continues to grow as more and more people are standing against the dangerous and deadly practices of the abortion industry. While matters of morality and ethics should not be based on public opinion, it is encouraging to see a steady pro-life trend in our country. Despite the abortion industry’s stance against policies that protect women’s health and safety, polling shows that people on both sides of the abortion debate support common-sense regulation of abortion. There has been a positive trend in America towards promoting and defending the sanctity of life. While life advocates will continue to be a voice for the defenseless preborn child regardless of public opinion, recent polls prove that when Americans are presented with the facts about abortion, more will choose life. 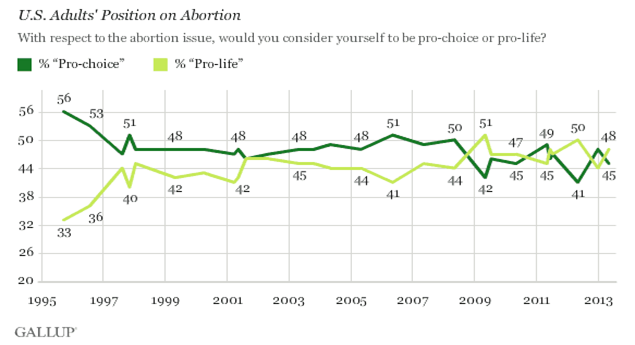 Abortion, Gallup, Inc., 2013, www.gallup.com/poll/1576/abortion.aspx (last visited Sept. 25, 2013). Lydia Saad, Common State Abortion Restrictions Spark Mixed Review, Gallup, July 25, 2011, www.gallup.com/poll/148631/common-state-abortion-restrictions-spark-mixed-reviews.aspx (last visited Sept. 25, 2013). Abortion poll on 20 week restriction, Quinnipiac, Aug. 2, 2013,www.quinnipiac.edu/institutes-and-centers/polling-institute/national/release-detail?ReleaseID=1931 (last visited Oct. 2, 2013).